In part two of this tutorial series we finished putting together the basics of our Simple Content Management System. It’s now possible to create, edit, and delete pages with pretty URLs. In this post, we’re going to look at adding an Administration section and defining which pages are public facing and which are private. We can now access the session hash to keep track of whether a user is logged in from request to request. We now have a convenient way to check if a user is logged in or not in views and route handlers. Let’s use this to add a login button to our application. 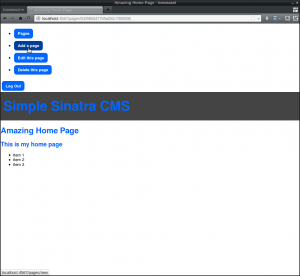 title= @title || "Simple Sinatra CMS"
The section after the body now checks to see if the user is logged in (by checking if the admin? helper method that we just created is true). If they are, then we will display the admin partial view (we’ll create this in a minute). If the user is not logged in, then a link is displayed to allow them to log in. This link has the classes .rounded.button that we created in the last tutorial so it appears as a button. It also contains the route /login, which we’ll handle shortly. This adds the “create new page” button as well as buttons for edit and delete that only show if you are looking at an actual page. These buttons should only be available if the user is logged in. In the previous version of our application, they were placed in other views, so we need to remove them now and limit them to only being in the admin view. These route handlers set the session[:admin] hash to true when the user logs in and to nil when the user logs out by visiting the relevant URL. This information is retained in the session hash using cookies and is then used by the admin? helper method that we just created to check whether the user is logged in or out. Both route handlers also use the handy back helper method that Sinatra provides. This will take the user back to whichever page they were viewing before they logged in or out. This should now all be working. Make sure you start the server running and then navigate to http://localhost:4567/pages and have a play around at logging in and out. You should only be able to see the buttons for adding, editing and deleting pages if you are logged in. The Most Insecure Security Ever? The eagle-eyed amongst you might have noticed that this authentication system is not particularly strong – there isn’t even a password! This is because having a strong auth procedure is an important business and beyond the scope of this tutorial. What we have done here is put the pieces in place so that a suitable auth solution can then be baked in to the relevant places. 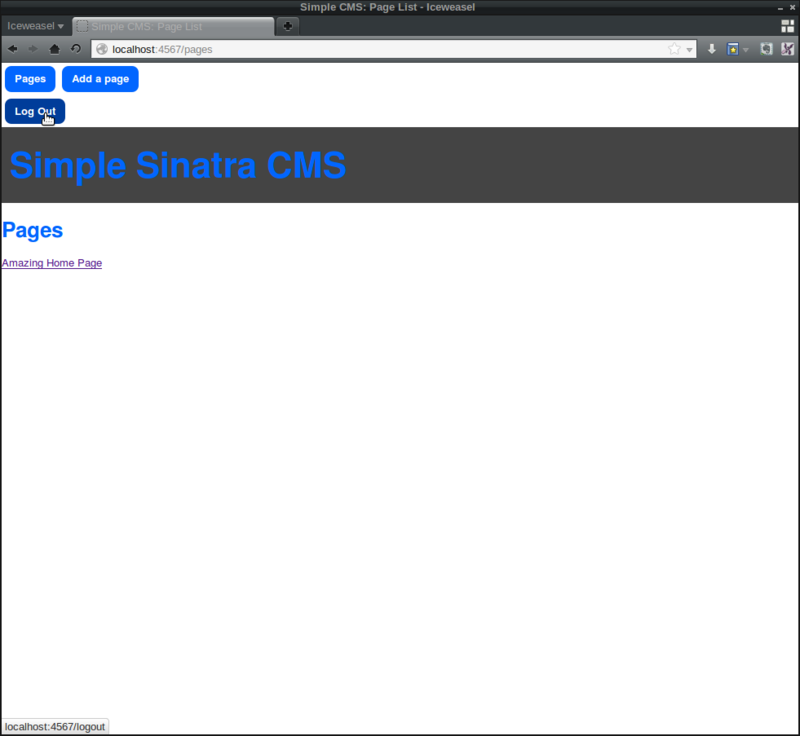 You might want take a look at the sinatra-auth gem (or one of the many other gems that provide auth). You could use Twitter Authentication or you could even roll your own solution. For the purposes of this tutorial though, I just wanted to demonstrate how the application would function differently depending on whether the user is logged in or not. We have a number of routes in our application that we don’t particularly want all users to access. In fact, most of the routes fall under this category, we actually only want the ‘show’ URLs to be visible to everybody. We have successfully hidden the buttons that link to the admin routes, but that might not stop a determined or curious user from simply typing the URLs directly into the browser address bar. For example, you can just navigate to ‘http://localhost:4567/pages/new’ to add a new page. We need to add some security to the routes themselves to actually only allow users to access these routes if they are logged in. This is done by creating a protected! helper method. halt 401,"You are not authorized to see this page!" unless admin? 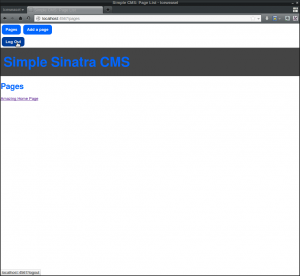 This uses Sinatra’s halt helper method to stop the request in its tracks and issue a 401 ‘unauthorized’ error with a custom message (this can be a string or you could create a view for it). Notice that we use the admin? helper method that we created at the beginning of this tutorial to check if the user is logged in, so the request will only be halted if the user is NOT logged in. Now none of these routes will be accessible to any users that are not logged in, even if they type the route directly into the browser. In the last post, we created pretty URLs that are based on the title of the page. These are the URLs that we would like to use for the majority of users – they look better and we don’t want them to see the IDs of each page exposed in the URL. This basically uses an if ... else block to check if the user is logged in using our same admin? helper. If the user is logged in, then the URL will use the page’s ID, otherwise it will use the page’s pretty URL. We can now just use this helper whenever we want to link to a page, confident that the correct URL will be displayed. Also, if we want to change the naming structure for the page URLs then we only have to do it in this one place. Now restart the server and play around with using the different functionality – check that the links are different depending on whether you are logged in or out. In this post, we’ve added an admininstration section to our content management system, albeit with possibly the least secure authentication system around. Despite the lack of security, the ability for users to log in has allowed us to separate the different views and functionality of the application. In the next post we’ll be looking at how to cache the pages as well as adding timestamps and versioning to the pages. 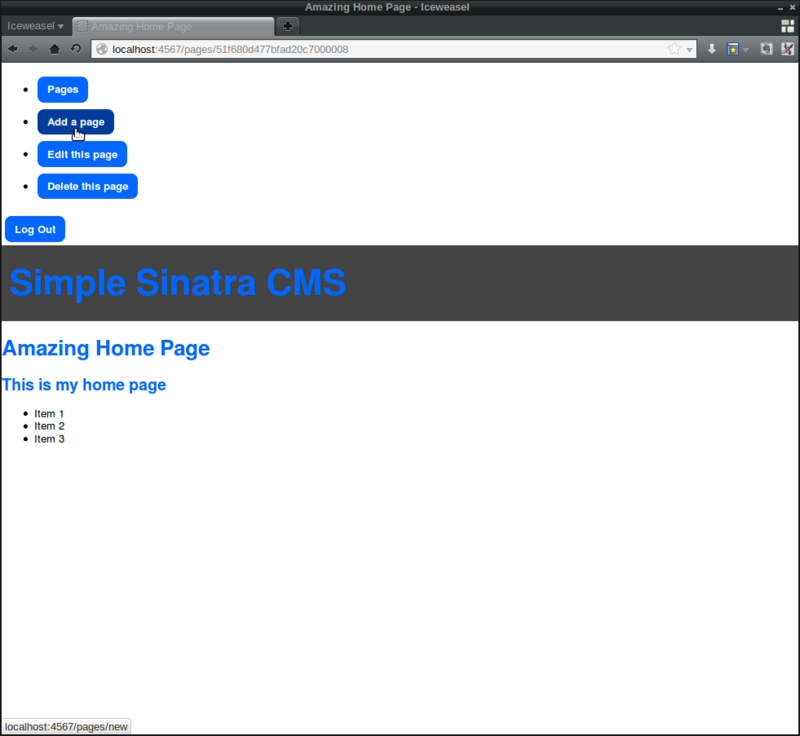 Please leave any comments below, as well as any requests for how you’d like to see this CMS develop.